Our Elixr Hemp CBD Product line has a CBD Absorption Rate of 92% powered by Viaderma Pharmaceutical’s Patent Pending Dual Carrier Technology. Elixr Cannabis has the exclusive global rights to this groundbreaking technology combined with any Cannabinoids. Our products are second to none due to this independent laboratory tested high absorption rate combined with Elixr’s CDB profile. Our CBD and Terpene profile, enriched with specific Essential Oils, Vitamin C, and Vitamin D, is crafted to alleviate Chronic Dry Skin, Psoriasis, Eczema, Rosacea, and many other skin conditions. CBD is known to have Anti-Inflammatory, Anti-Oxidant, and Anti-Aging properties that absorbs into the skin and provides overall healing benefits. All our products are proudly Cruelty-free, 100% Toxin-free, Sodium Lauryl Sulfate free, Phthalate free, Parabens free, Petrochemicals free, Triclosan-free, Diethanolamine free and best of all, are handcrafted in Victoria, BC. 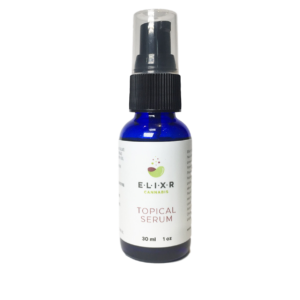 Elixr’s powerful CBD Topical Serum is formulated using organic plant-based oils that easily absorb into the skin without leaving any excess grease. The essential oil blend promotes circulation to the skin membrane, reduces inflammation, and provides overall healing benefits. Saturated with a higher concentration of CBD, the Serum is designed for use on skin conditions that need extra strong healing power. Directions: Use 1-2 pumps of the Topical Serum and rub directly onto affected area. 32.0 MG of CBD Crystalline Isolate, 42.0 MG of CBD Fortified Broad Spectrum Hemp Oil (containing micro-dosing of CBG, CBV, CBN, Linalool, Caryophyllene, and A-Pinene), Organic Jojoba Oil, Organic Coconut Oil, Organic Sunflower Oil, Rosemary Extract. 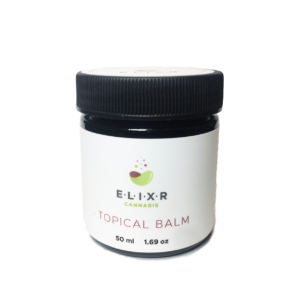 Elixr’s full-bodied CBD Topical Balm is formulated using organic plant-based oils and a beeswax emulsifier to help provide a thicker application to the skin membrane and provide long-lasting hydration to the tissues. Designed to be used on thicker tough skin areas like heels, knees, elbows, and hands where problem skin conditions can occur. The essential oils used have deep penetrating properties that help accelerate the healing power of the CDB. Directions: Rub Topical Balm directly onto affected areas. Use daily for best results. 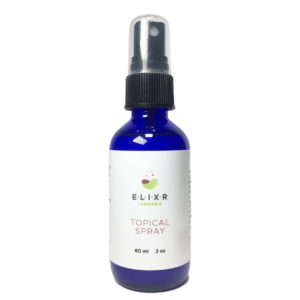 Elixr’s CBD Topical Spray is formulated using ingredients known for their effectiveness in reducing irritation and inflammation that occurs topically on the skin. The essential oils act as an astringent as well as anti-inflammatory offering high-speed results. Designed for lighter use and regular maintenance on anywhere problem skin conditions exist… even on your scalp. The special blend gives a light and refreshing sensation. Lightly spray on your face (eyes closed) to experience an awakening like none other. Directions: Shake well before use and spray onto the skin. For best results, use in combination with the topical serum or balm.